Clips N Grips Flatfold birdseye weave fabric diapers comes in assorted colors. Birdseye weave fabric is made from many small fine yarns woven in a pattern, that provides a soft, quick drying and absorbent diaper. 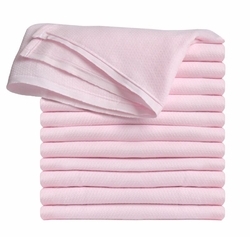 These Birdseye flatfold diapers are made of a lightweight fabric that is soft and quick drying. Flatfold diapers have the same thickness throughout so this diaper is Ideal for using as a burp cloth. Mom can customize the fold when burping baby. Also ideal for crafting, using as a cleaning cloth, car washing and waxing. Great item for gift giving!